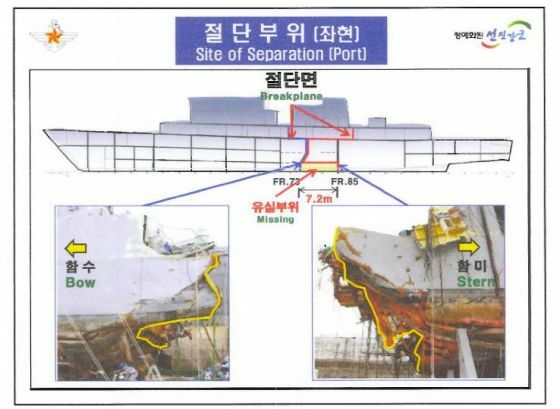 The text and visual aids released at last week’s press conference on the findings of the multinational investigation into the sinking of the South Korean warship Cheonan are now available. The nature of the event now appears beyond serious dispute, so the debate has moved to the realm of politics and intentions. Ruediger Frank of the University of Vienna has a piece at 38 North speculating that someone high up in the North Korean military hierarchy may have been responsible, rather than Kim Jong Il. But I’m afraid that I don’t quite follow his reasoning. Although the American officials who spoke about the intelligence assessment would not reveal much about what led them to conclude that Mr. Kim [i.e., Kim Jong Il] was directly involved, one factor appeared to be intelligence that he appeared on April 25, the anniversary of the founding of the Korean People’s Army, with a military unit that intelligence agencies believe to have been responsible for the attack. Look, this is not what I want to be telling you, but the outlook for nuclear diplomacy is very poor. Little threatens to distract Stephen Bosworth from his deanly duties at Tufts. As always, SK responses are mediated by the knowledge that NK can hit Seoul with 100,000 artillery shells of 152mm or larger in the first 5 minutes of any “disagreement”. Doing so will eventually spell death for the NK regime, but they can inflict massive conventional arms damage until the decapitation occurs. There remain a host of unanswered questions behind this issue. For instance, was the Cheonan a target of opportunity or a pre-planned attack? Do DPRK naval vessels have standing orders to fire upon RoK ships in the disputed waters? Was the DPRK sub conducting routine naval maneuvers when the Cheonan crossed its path or was it deliberately waiting for a RoK naval vessel to sail into its operating area? How often do RoK naval vessels operate in the disputed waters and do the travel along predictable routes? Since my friend Ridger Frank probably doesnt read this blog (although I do religiously), I think his article makes perfect sense. It was purely a riff on what if Kim in fact wasnt behind the sinking and what that would mean rather than the standard stuff about it being revenge and intended to humiliate the South. The problem with almost everyone who anlayzes North Korea is that they arent willing to consider all the alternatives or they just follow the pack. So hats off to Rudiger for at least thinking out of the box. Don’t think I quite agree with Sanger’s sources’ reasoning on Kim Jong Il having authorized the attack. Maybe he did, of course. I sure don’t know either way. But if he hadn’t done so, wouldn’t he have gone out of his way to make it look like he had? Just to make it look like he’s still got a firm grip? Best way to do that: give the general that screwed up, and/or exceeded his authority, a medal. Thanks for your comment. (Joel Wit, in case anyone here doesn’t already know, is the prime mover behind 38 North, among other things.) If we are to read RF’s article as exploratory, it works well enough that way. Fair enough — there’s a place for thinking aloud. Although I’m not sure everyone has read it that way. As you can see, there’s a healthy acknowledgment of uncertainty in there. If, per your suggestion, Gen. Kim Myong-guk is being promoted for disobedience — although I rather doubt it — then we’re back in RF’s scenario space, aren’t we? But there are very few signs of KJI’s being that weak. He was just in China, after all. Leaving the country to conduct foreign relations in person doesn’t seem like the act of a profoundly insecure ruler.